Be happy. Be yourself. If others don’t like it, let them be. Happiness is a choice. 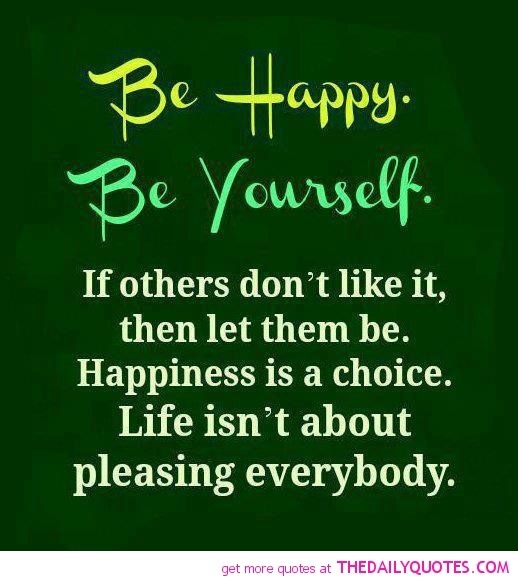 Life isn’t about pleasing everybody. I’ve got tell you, these past few months have taught me a lot about this. About choosing to be happy. Although, I think sometimes we don’t recognize when we are trying to please everyone. I was taught to be compassionate, to be helpful, to be kind. And I believe in these principles whole-heartedly but I know sometimes I end up doing this too much. Sometimes tolerance of one thing turns into complacency, and that’s not a good thing. And that is where this quote steps in. Be yourself. Be happy. If that makes others uncomfortable that’s their problem not yours. And I’m not talking about being rude or disrespectful. Just to be mindful of when you’re sacrificing your happiness for others. There are always consequences.